Pelvic organ prolapse is a prevalent condition, with up to 12 % of women requiring surgery in their lifetime. This manuscript reviews the treatment options for apical prolapse, specifically. Both conservative and surgical management options are acceptable and should be based on patient preferences. Pessaries are the most commonly used conservative management options. Guided pelvic floor muscle training is more beneficial than self-taught Kegel exercises, though may not be effective for high stage or apical prolapse. Surgical treatment options include abdominal and vaginal approaches, the latter of which can be performed open, laparoscopically, and robotically. A systematic review has demonstrated that sacrocolpopexy has better long-term success for treatment of apical prolapse than vaginal techniques, but vaginal surgery can be considered an acceptable alternative. Recent data has demonstrated equal efficacy between uterosacral ligament suspension and sacrospinous ligament suspension at 1 year. To date, two randomized controlled trials have demonstrated equal efficacy between robotic and laparoscopic sacrocolpopexy. Though abdominal approaches may have increased long-term durability, when counseling their patients, surgeons should consider longer operating times and increased pain and cost with these procedures compared to vaginal surgery. • Pelvic floor physical therapy (PFPT) with a physical therapist is the best approach to conservative management of apical prolapse . • Pessaries should be managed with regular follow-up care to minimize complications [14•]. • Minimally invasive sacrocolpopexy appears as effective as the gold standard abdominal sacrocolpopexy (ASC) [42•]. • Robotic assisted sacrocolpopexy (RASC) and laparoscopic assisted sacrocolpopexy (LASC) are equally effective and should be utilized by pelvic floor surgeons based on their skill level and expertise in laparoscopy [44, 45•]. • Uterosacral ligament suspension (USLS) and sacrospinous ligament suspension (SSLS) are considered equally effective procedures and can be combined with a vaginal hysterectomy. • Obliterative procedures are effective but are considered definitive surgery [24••]. • The use of transvaginal mesh has been shown in some studies to be superior to native tissue repairs with regard to anatomic outcomes, but complication rates are higher. Transvaginal mesh should be reserved for surgeons with adequate training so that complications are minimized. Dr. Alexandriah N. Alas and Dr. Jennifer T. Anger each declare no potential conflicts of interest. Administration UFaD. FDA public health notification: serious complications associated with transvaginal placement of surgical mesh in repair of pelvic organ prolapse and stress urinary incontinence. US Food and Drug Administration 2008. Available from: http://www.fda.gov/MedicalDevices/Safety/AlertsandNotices/PublicHealthNotifications/ucm061976.htm. Accessed 3 Sept 2014. Administration UFaD. FDA safety communication: update on serious complications associated with transvaginal placement of surgical mesh for pelvic organ prolapse. US Food and Drug Administration 2011. Available from: http://www.fda.gov/Safety/MedWatch/SafetyInformation/SafetyAlertsforHumanMedicalProducts/ucm079028.htm. Accessed 3 Sept 2014. AUGS Position Statement on the Restriction of Surgical Options for Pelvic Floor Disorders 2013. Available from: http://www.augs.org/guidelines-statements. Accessed 3 Sept 2014. After the FDA vaginal mesh warning, the American Urogynecological Society released their position statement. They stated that the FDA warning only applied to vaginal prolpase mesh, and not to abdominal or incontinence slings. They also stated that choosing to use such devices should be a descision made between the patient and the surgeon. Charles Nager MD. Study of Uterine Prolapse Procedures - Randomized Trial (SUPeR). Available at: http://clinicaltrials.gov/show/NCT01802281. Accessed 3 Sept 2014. 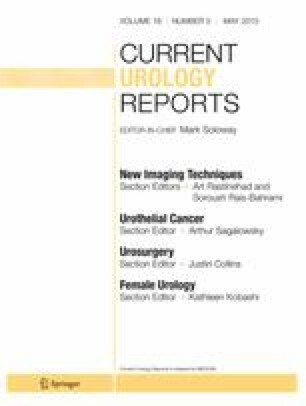 This ongoing RCT will compare vaginal hysterectomy with uterosacral vault suspension to hysteropexy using a sacrospinous mesh kit evaluating three year outcome data.